Yooralla Speaktank is a program which provides the opportunity for people with experiences of disability to educate, raise awareness, stimulate discussions and share their own experiences with a variety of audiences.Yooralla Speaktank aims to empower people to speak for themselves and play an educative role in the community through stimulating discussions, and sharing their own lived experiences of disability. Speaktank speakers may be a person with disability or a family member, carer or volunteer of a person with disability. Public speaking training is provided and we work with each speaker to understand their topics of interest and preferred audiences. We work to match a speaker’s passion and area of interest with the appropriate audience. A member of Yooralla’s Marketing & Communications team accompanies speakers to events to co-present and assist with questions. Act in a professional manner with no past recorded history of abusive, aggressive or violent behaviour. Demonstrated ability to develop positive relationships with previous employers, community members and colleagues. Have the capacity to work collaboratively with service providers, community members and other speakers. Have a genuine interest in educating the community about disability. Are 16 years of age or over. Able to reflect on broader community issues in addition to focusing on personal or individual issues. Have a broad understanding of Yooralla’s services. Have an interest in supporting other Yooralla SpeakTank participants throughout the program and be a team player. Present and speak on behalf of Yooralla and the wider community at events, schools, corporate engagements and other engagements. During speaking engagement, share and reflect upon on personal experiences and stories as a person with a disability, carer or family member. 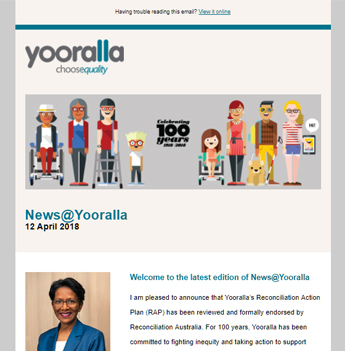 During speaking engagement, speak positively and promote Yooralla, our services and the wider community and provide information on the National Disability Insurance Scheme. Devote the required time to attend training and other activities as required wherever possible. Adhere to relevant organisational policies and procedures. Ensure that the confidentiality of other Yooralla service users and staff is maintained and all information that may identify such individuals is kept confidential. Where a speaker wishes to publicly discuss or debate issues arising from personal experiences or circumstances, they must refrain from identifying any other person involved. To enquire about becoming a Speaktank speaker please complete an online enquiry form or call 03 9666 4500.